We all have set-backs, and days when we feel discouraged. At times like those, it’s good to remember that those old clichés such as “Rome wasn’t built in a day” exist for a reason. To be successful at reaching your goals, keep in mind the following 5 traits of successful people. Adopting the right habits and attitudes can help keep you on track. There isn’t a single successful person who achieved their dreams without working for them. Being industrious means working hard and learning as much as you possibly can. It’s also important to understand the concept of delayed gratification as you’re working towards your goals. Discipline is what separates the leaders from the followers. To make changes in your life (even positive ones), sometimes it means doing things you don’t want to. Being consistent is intertwined with persistence. You need to perform in a dependable manner, regardless of situations and hindrances, to get the results you want in the end. Problems are a part of every person’s life, however it is the resilient one who prevails and achieves their goals. Learn from your past mistakes and use the experience to come up with more productive actions the next time around. Some of the most successful people, as well as those that truly left a mark on history are known to have faced many difficulties before the world recognized and appreciated them. If possible, try to stay positive through the tough times and the problems that arise. Stay optimistic and keep believing that you will reach your goals no matter what. When you tell yourself that you will get there sooner rather than later, the odds are that you will. Some goals are huge, and will take time to accomplish. Don’t allow yourself to believe that some goals are simply too big to be possible. Start with goals that are attainable in your current situation, and begin working towards those. As you realize those goals, start breaking down the bigger ones into smaller tasks that are easier to do, and soon you will realize that you have accomplished some pretty big ones too! If you try to practice these habits and keep a positive attitude, you will find that good things will start to happen and you will realize that those goals weren’t so unreachable after all! 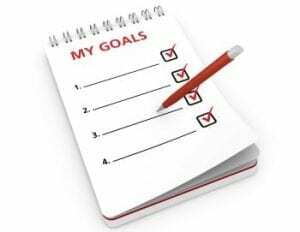 What’s the biggest goal you’ve ever set for yourself and attained? How did you do it? I would love to hear from you! Next articleLet Go and Fly!